Seeking an immediate sale, the owner of the motor yacht Ligaya has authorised a €900,000 reduction on her asking price, brokers Yacht Management Group informs us. The 38 metre motor yacht was built by Ocean Pacifico in 2002 and accommodates 10 guests in a master, three doubles and a twin. She is powered by twin Caterpillar engines giving her a cruising speed of 11 knots and a top speed of 13.7 knots. 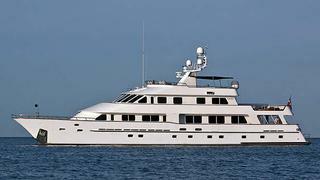 Ligaya is now asking €4.9 million, down from €5.8 million.